EDIT: Giveaway is officially over. Congratulations to Stephanie La Plante for submitting the randomly chosen 575th entry. I shied away from heart jewelry until I fell in love - wearing the symbol before I truly experienced it just amplified my teenage angst. Now I'm making up for lost time. 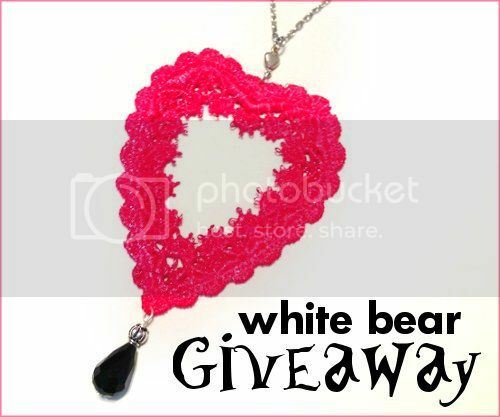 At first sight, I knew my readers would desire a lace heart necklace by Lindsay of White Bear Accessories as much as I do. She's such a sweetheart that she's agreed to give away the lace necklace above! The lace heart has been hand painted a metallic reddish pink in anticipation of Valentine's Day. A beautiful black glass bead embellishes the design with a subtle shine. The heart pendant measures 4 x 5 inches and is married to an antiqued silver chain. Using lace to create everyday jewelry is rare - but the combination came to Lindsay naturally. Vintage treasures and romantic eras inspire her sweet style. She puts a modern twist to the dainty material by hand painting her jewelry line in striking colors. My adoration of vibrant color is no secret, so discovering customers can choose customized jewelry from over 50 shades of colors made me giddy. Lindsay's creations won't just make you feel pretty - they'll make a statement, too! Use the Rafflecopter below to enter to win Lindsay's jewelry giveaway before 11:59pm EST on February 20, 2013. Be sure to leave the mandatory comment on the blog post with the same name you use to fill out the Rafflecopter - all entries by winner must be easily verified or a new winner will be chosen. I really like the Lace Necklace Hand Painted - Red Pink Black Ombre Beaded Choker . I've chosen this bracelet as a favourite. I adore the Collar Necklace Hand Painted Lace Jewelry - Ombre Blue and White Peter Pan Bib! I really like these earrings....http://www.shop-ethereal.com/products/978768-neon-earrings-in-lime-and-teal-green-acrylic-rhinestones...ciao4now64 at yahoo dot com. I love the Lace Necklace Hand Painted - Mint and Purple Ombre Flower. Thanks for the chance!! My favorite item is the Vintage Bracelet Metal Multicolored. It is beautiful. I love the uniqueness of it. Awesome! Thanks so much for the chance! I love White Bear! I like the Pink Beaded Bracelet SET of 2 Pearls and Peace Sign. I really love the Tiny Gold Angels Wings Neckalce! The blue statement necklace is gorgeous! i love the lace necklace hand painted mintand purple ombre flower. pretty. Favorite item is the Gold Bracelet SET of 3 Cross Bracelet Love and Bar Crystal Rhinestones! My favourite item is Silver Bracelet SET of 3 Cross Bracelet Love and Bar Crystal Rhinestones. It's very unique. I love Bronze Starfish Ring! Looks cool! The Tiny Gold Bow necklace is so pretty! Christina - xristya@rock.com - I just love the Gold And Red Hamsa necklace, it's beautiful! My favorite is the Sideways Cross Beaded Bracelet in Blue and Silver Rhinestones. I love the crystal necklace. Simple and sweet! I love the amazing Multicolored Acrylic Rhinestone Necklace! I love the crystal necklace! I like the Pink Skull Earrings! I like the Red Flower and Crystal Rhinestone Earrings. I love Lace Bracelet Ombre Teal and Blue. Like the Tiny Gold and White Heart Necklace. i love the purple and bronze butterfly earrings! Blue and Gold bracelet is pretty. ~~~~~~~~ABSOLUTELY IN LOVE~~~~~~~~~The Lace Earrings in Brown Leaves are absolutely lovely!!!! Would cherish these earrings forever! I work in a winery tasting room where I see thousands of people a year. Would love to show off your earrings! I really like Silver, White and Grey Rhinestone Necklace. It is very cute. I love the teal green white, and gold necklace. I love all the lace jewelry! Thanks for the giveaway! I like the simple crystal necklace! Thank you for your beatiful jewelry ! Loooove the lace necklace ship wheel! My favorite by far. I adore the tiny gold heart earrings! I really like the Pearl Bow Necklace. I also love the Vintage Bracelet Metal Multicolored Thank you! My favorite is the "Lace Necklace Hand Painted - Nautical Jewelry Mint Green Teal Ombre - Customizable Colors with Ship Wheel"
I like the Neon Bracelet 3 in Yellow Pink Grey - Acrylic Rhinestones. Tiny gold anchor earrings are so cute! I liked the Black Mustache Ring.